Reports circulating on Tuesday morning suggest that Chelsea are genuinely serious with their interest in Real Madrid defender Rafael Varane. The Blues have been linked with the French International for some time now but it seems that an official offer could be on the cards, and the pursuit to take place this summer with Madrid willing to listen. There will be competition for the 21-year old who is one of the best young defenders in the world. 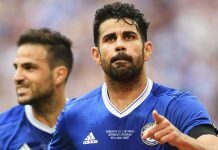 Manchester United are also wanting to make their move but it is Chelsea who are clear favourites and are looking to come up with the £40 million fee that is wanted by Madrid. Jose Mourinho has shown no secret of his admiration for his former player and will no doubt be looking at him for a top quality long term replacement for captain John Terry, who is still yet to sign a contract extension. Varane is a regular for both club and country and has been for some time, he has matured beyond his age this year and has become one of the best around. If Chelsea can win further honours this season, it will surely tempt him to make a move to Stamford Bridge. Next articleZlatan Ibrahimovic and Raheem Sterling to Chelsea?